No I don’t think it’s foolish to wonder where is St. Canard located because when the show was new it was debated right here…for quite a while. All I can say is that it’s a fictional creation. In the 60’s I had a cool cartoon poster of San Francisco that made it look like an island city which is sort of the feel of the St. Canard establishing shot. But since DW played with the archetypes of Batman and the Green Hornet, it’s probably closer to New York, or at least Gotham. Well, the Shadow was certainly the inspiration for his “I am the shadow that stalks in the night” riffs. His echoing announcements were like the Shadow’s laugh. 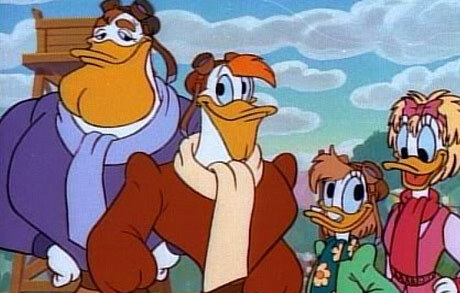 Originally, there were to be no variations but a very early script had Launchpad masquerading as Darkwing and saying something like “I am the road salt that rots the underside of your car” or whatever. 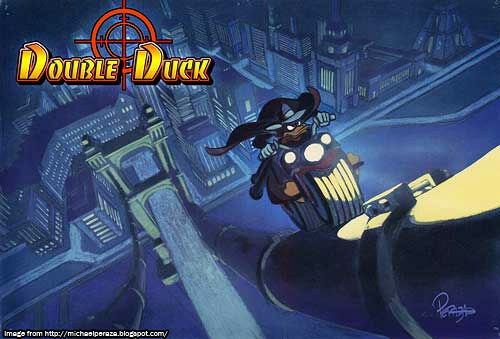 We thought it was funny and had no problem coming up with new analogies so it became part of Darkwing’s style. Some early discussions had Darkwing be the decendant of a 1930’s hero but we felt it was more interesting to kids to be the original. I guess it’s up to Gosalyn to carry on the tradition. I don’t think we ever explained Honker’s learning about Darkwing. We had more interesting stories to tell. That’s why Tank Muddlefoot disappeared. The show wasn’t about the kids and the neighborhood so we didn’t need a kid antagonist (although he was used to good effect in the first Splatter Phoenix episode and the first one with the alien hats). Launchpad becamed enamored of the exploits of Darkwing Duck and decided he had to be part of the action. Again, the series wasn’t about Launchpad so we didn’t spend time on it. “Double-O Duck” a Bond type spy fell to me to develop. I hated the idea. Spy spoofs were old hat. The Bond franchise was moribund at the time. I gave it a shot but it was basic parody. Gizmoduck and Launchpad being spies. No heart. No sense of family. I felt like it didn’t have a chance of making the cut. I pitched it to Jeffrey Katzenberg. He said it was just basic parody. No heart. No sense of family. He said do it over. Realizing I was not going to escape the assignment, I threw out most of the spy motif and thought about Doc Savage and the Shadow. Soon the familiar duck took form but he just looked like Donald in mask and cape. (I hated the Double-O name but that’s what Jeffrey was hanging onto). The project didn’t jell until the idea of this super cool guy (Looking good while doing good) who had to raise a hellion of a daughter. The art you saw was mostly rushed out under deadline by Bob Kline. The project was set to move ahead when legal called and said we couldn’t use the “Double-O” moniker which was locked to Mr. Bond. We had a contest to find a new name. The winner was Alan Burnett who came up with Darkwing (then left a little while later to help create the new version of BATMAN). I added the “Duck” in to make it half serious half silly. Then the real art design began. I came up with the costume, I think, but the duck design was Toby Shelton’s. People wonder why Launchpad ended up as a sidekick. Truth is, he was fresh in my mind because of the early Double-O development. He replaced some guy in a derby…can’t remember his name. The spy version of Double-O never really got beyond pitch cards. It was all part of a process that led to Darkwing so characters and concepts weren’t dropped as much as they mutated.